"From what had gone before this was certain to be..........A Picnic." Just a little update for you. The hotel has now increased the maximum number of attendees we can have to two hundred and it looks like the event has now sold out at that number. There is one questions that we are asked every year at the Picnic Show.......When will the next one be? Well the answers is...... Sunday, 25th August 2019. Join us for the fourteenth Picnic Show in a row at Oakley Court on the August Bank Holiday weekend. For those of you that don't know, Oakley Court was the original filming location for The Rocky Horror Picture Show and is now an exclusive, beautiful, relaxing, peaceful, stunning, friendly, hotel. The TimeWarp picnic is your chance to meet up with friends old and new and the one day each year when we can all wear our costumes around the hotel without a problem. We do ask that people cover up the more revealing costumes in the more public areas of the hotel and you won't get to wear them in the restaurant either - although in 2010 we did use it for the movie screening, so that was the exception! 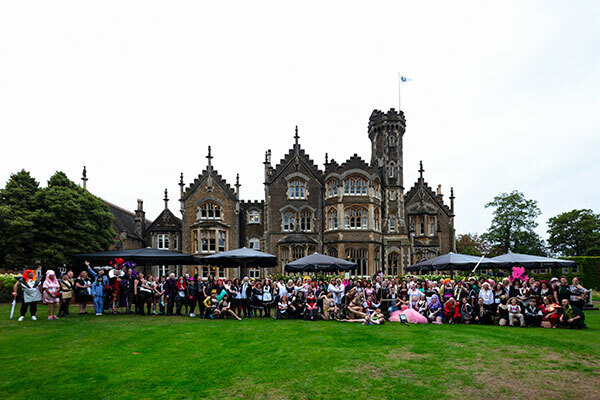 Booking is now open for the Timewarp Rocky Horror Picnic at Oakley Court, 2019. Phone the hotel and quote "TimeWarp Picnic". The price for the 2019 event is £260 per room (which is just £10 more than the 2018 picnic rate). That gets you accomodation for two for the Sunday night, all the food and (soft) drinks for the Picnic itself and (a rather nice!) breakfast the next day. We are also planning to have another late night screening of The Rocky Horror Picture Show as part of the fun. Get to watch the house on the movie while in the house that is on the movie! Remember the cost is per room - not per person, so two people sharing would pay just £130 each to stay at Oakley Court and attend the picnic. Quite a few of the people at the 2018 event have booked for 2019 already, so rooms have already gone. The event has now reached the stage where there is a limit of 148 places available, this is the maximum we can fit into the screening room and standby area in case of wet weather for the picnic itself. Luckily we have only had to use that three times over the years when it has rained. Book by telephone on: 01753 609988 quoting "TimeWarp Picnic 2019"
Reservations at Oakley Court are the best people to talk on the phone to to book. The hotel love having TimeWarp and the Picnic there each year and you don't even have to be a member of the fan club to book, the event is open to all fans of Rocky who want to book. For more information about the event, please see the main Picnic Show page for our frequently asked questions.